We had lasagna for Christmas dinner in celebration of our Irish heritage. Then we watched Roma, a movie that blew us away. Black and white. In Spanish. Based in a household in Mexico City in the 1970s. The lead actress is a compete novice (and absolutely amazing). Subtle. Filled with every emotion. Mrs. Rootchopper thinks it will win the Academy Award for sound editing. I think it will win for cinematography. I don’t know what other foreign language films have been released but this one has to be nominated for Best Foreign Language Film, and maybe Best Picture. And we drank wine. Which interrupts my sleep cycle. So on four hours of intermittent sleep I awoke well before dawn. I took my car to the mechanic. It was in the 20s. I walked 1 1/4 miles home. Then I took my wife’s car to the same mechanic. And walked 1 1/4 miles home. I walked right past a Dunkin’ Donuts and didn’t go inside. After breakfast and stalling for warmer air, I rode my Cross Check 7 miles to the bank. Then I rode another few miles just for the hell of it. On the way home I stopped at the gym and lifted some weights. Next I hit the grocery story for coffee and oatmeal. I arrived home after riding 23 miles. I ate lunch. Read some National Geographic. And rode Little Nellie to the mechanic to pick up my wife’s car. I folded Little Nellie into the trunk and drove home. I didn’t touch a box. But I won Boxing Day. Here we go again. In no particular order, my personal faves from 2018. Breathing Is Good: In January, I recovered from the after effects of pulmonary embolisms. The fun included pneumonia and a collapsed right lung. I am grateful to everyone who helped me recover and kept my spirits up. Five Hundred States: With the help of Kevin W., Michael B., Rachel C., Jeanne, and Jesse, I rode my tenth 50 States Ride in DC. The ride goes all over the city to traverse all 50 streets named for states. With healthy lungs, and an appropriately geared bike (it’s a very hilly ride), and a massive mileage base in my legs, I made it all 60-odd miles without undue distress. The Kids Are Alright: My daughter completed the degree requirements (classes and a thesis) for her masters degree in International Dispute Resolution from Kings College in London. She’s back in DC interning at the Irish embassy, while looking to launch her salaried career. Meanwhile, on the other side of the world in Phuket, Thailand, my son completed his PADI (Professional Association of Diving Instructors) certification. Assuming his work visa is approved, he will be making money scuba diving in paradise. Good work if you can get it. Marching for Sanity: Although I didn’t blog about it, I attended the March for Our Lives, concerning changing our gun laws, in DC. There were several hundred thousand people in attendance. I think the proliferation of guns, particularly semi-automatic weapons, in this country is insane. Somewhere along the line, our courts forgot about Life, Liberty, and the Pursuit of Happiness. End of screed. Where’s My Ring? : For most of my life, the one sport that I have followed is baseball. This year’s Washington Nationals performed well below expectations. Never the less, the season still held its joys. Magic Juan came to town and did Juan things. Oh, and while I was watching the boys of summer, the boys of winter, the Washington Capitals, took the Stanley Cup, a development that cost me several hundred dollars in motels so I could watch the games as I rode across the country. And, as far as baseball is concerned, seeing the Saux win the World Series was a pretty good consolation prize. Take Me Out to the Deluge: 2018 was the wettest year on record in DC. And don’t I know it. The C&O Canal towpath was wiped out in several sections forcing me to ride a much hillier route on the first two days of my bike tour. I also opted out of a attending a half dozen Washington Nationals baseball games to avoid rainouts, not to mention sitting through a miserable rainy game in September. Considering the fact that we had a nearly snowless winter, this new rainfall record is incredible. Living the Dream: For most of my life, I have dreamed of riding a bike across the country. This year under the banner of the Any Road Tour, I left my home on May 22 and, on July 20, I pushed The Mule over a big sand dune and dipped its front wheel into the Pacific Ocean. With another 100 or so miles of riding to and around Portland Oregon, I rode 4,300 miles in two months. Alone. Dang. You Meet the Darndest People: Riding across the country means you’ll interact with dozens of strangers. On my tour I met a gold miner, a jewelry maker, a portrait artist, a plant nerd, a Swiss elevator man, a family of Mexican American itinerant construction workers, two Postmistresses, an antique dealer, a woman with packages of cookies in her oven, a dozen or so east bound bike tourists, and a man who reminisced about the circus of his youth. And See the Darndest Things: You never know what you’re going to see on a bicycle trip. I saw the Wright Brother’s Bicycle Shop, the Painted Canyon, turquoise mountain waters, a perfect beer belly, Square Butte, painted farmland in Iowa, Big Ole, and six mountain pass signs in the Rockies and the Northern Cascades. Dang. Reconnecting: My bike tour allowed me to reconnect with old friends and meet a few other friend-ish folks. So hats off to Earl and Anne; Kathy, Russ, and Krista; Emma; Tim and Michele; Shannon, Jeff, and Tommy; and Eric. They fed me, sheltered me, and showed me their sights. When I got back to DC, I spent an afternoon with Susana to talk about my tours. And went to a happy hour and dinner with my former co-worker Jessica whose adventures in Chile (not to mention Ecuador and Argentina) inspired the heck out of me. The Nigel Tufnel Award – Conventional Wisdom? : I rode my bike tour east to west. Many people told me this would be a big mistake because I would expose myself to endless days of soul sucking headwinds. Instead, I had tailwinds for most of the tour. The eastbound bike tourists that I met on the road were all complaining about the relentless headwinds! Although I had to climb five mountain passes in four days in the Northern Cascades of Washington state, I had a total blast flying down the mountains at 35 miles per hour. And the views were spectacular. Eastbound riders have to tackle this formidable terrain during their first week of riding. And, if you start your tour in May, you get to freeze during the descents. Have fun with that. My basic (non-touring) retirement plan was to ride my bike (or hike) every day and do one other thing. This other thing could include a social activity like a happy hour or an adulting thing like grocery shopping. A few weeks ago I started substituting napping for “one other thing.” After I while I was beginning to feel rather pathetic so I decided to make an earnest effort to get back in the game. Within the last couple of weeks I have attended my old office’s holiday lunch, the Washington Area Bicyclists Association holiday party, a happy hour with my wife and some former co-workers, a concert (Mumford and Sons with Maggie Rogers as the opening act) with my wife and daughter, the Hains Point 100 bike event (in the cold rain), two Friday Coffee Clubs, and a happy hour with my former co-worker Jessica. My daughter, who is interning at the Irish embassy in DC, took me to a screening of Black ’47, a film set during the Irish potato famine. The screening was sponsored by the embassy. Before the film, the Irish ambassador made some remarks about the movie and its historical context. Ireland had a population of about eight million before the famine. One million Irish citizens died as a result of the famine while another million emigrated to the mostly to the U.S. and Canada, but also to Great Britain and Australia. After the film I met the ambassador who happened to be sitting behind me during the screening. This experience prompted me to get my Irish citizenship application process in gear again. A few months ago I had been denied access to a couple of family vital records for lack of proof of lineage and sworn affidavits affirming that I was seeking to acquire these documents for good cause. This week, I found the documents to prove lineage and then I rode to a notary public and had the avidavits notarized. I mailed all this paperwork so I should be in good shape in a month or so to apply for entry into the Registry of Foreign Births. One day last week I discovered that I had 23 matured EE U.S. Savings bonds. So I spent an evening entering data into the U.S. Treasury’s website. I spent Monday morning in a bank redeeming them. Lo and behold, my bonds were worth over $4,000. Dang. My son moved to Thailand over three years ago. His car – which I call the Millennium Falcon – has been sitting in front of our house slowly absorbing money for insurance, taxes, and maintenance. Today my wife and I sold it, put the money in his bank account, and contacted the state and local authorities and our insurance company that the car was sold. 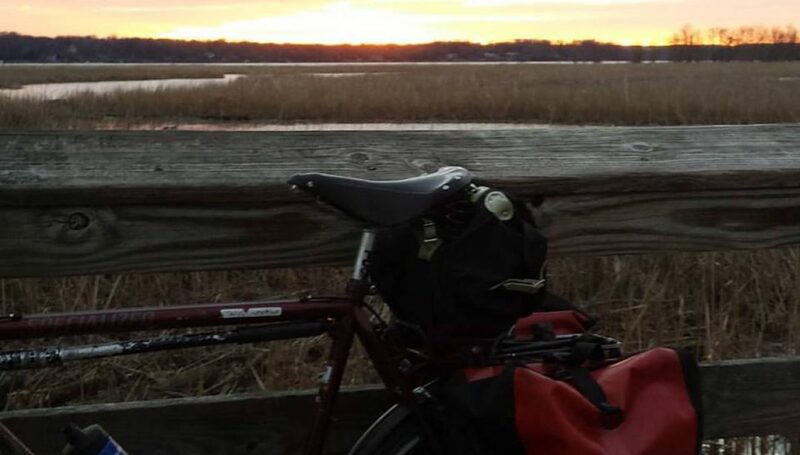 Still to come before Christmas is one more #bikedc happy hour, a Friday Coffee Club, and a performance by my friend Rachel’s instrumental trio at a local restaurant. Speaking of Christmas, we are toning it way down this year. No big live tree, just a little fake one with lights on it. Stockings are hung. Decorations include a few lights outside and some ribbons and wreaths here and there. The big change is we are not doing presents. As an utterly incompetent consumer, I find gift giving incredibly stressful and, more often than not, a complete waste of money. It’s fun when your kids are little or when you are in a new-ish relationship, neither of which apply to my household. The DC area has some truly wonderful multiuse paths, or what we humans call bike trails. As the DC bicycling community grows, these trails become more than just a recreational resource. Thousands of people use these trails every day to get to and from work and to run carfree errands. So it is important that they are maintained properly. I came across two good examples of trail maintenance today. In Arlington, the Four Mile Run Trail connects the Washington and Old Dominion (W&OD) Trail to the Mount Vernon Trail. The entire Four Mile Run Trail had been treated with brine to keep rain from freezing. Unfortunately, the treatment stops at the Mount Vernon Trail which is maintained by the National Park Service. Alexandria City doesn’t treat their trails either. But somebody, either the city or the Park Service or a landowner, fixed a troublesome spot on the Mount Vernon Trail yesterday. At the north end of Old Town in a mixed use development called Canal Place, the trail zig zags across a set of railroad tracks that run parallel to the trail. (Of course, these tracks are a hazard in and of themselves. I watched a man crash his bike a couple of years ago when his wheel got caught up in the rails). Whoever does such things came along yesterday and smoothed all these bumps out. You still have to negotiate the tracks and do a zigzag but one aspect of this hazardous little trail segment has been fixed. I rode 23 out of 30 days in November. Mostly I took time off the bike because I am tired and sore. Hell, I ought to be. Anyway, it’s a good idea to listen to my body. I rode 764 miles, my lowest total since March. I did two bike events during the month. The Cider Ride made for a 55-mile day. The Tour de Mt Vernon. My longest ride was a hilly 70-mile ride around most of the perimeter of DC. During the month, I crossed the 11,000 mile threshold for 2018. Considering the fact that I began the year with a collapsed lung, 11,000 miles is not too shabby.